Objective To evaluate new classification criteria for peripheral spondyloarthritis (SpA) in patients with SpA with peripheral manifestations only. Methods In this Assessment of SpondyloArthritis international Society (ASAS) study, two prespecified sets of criteria were compared against the European Spondylarthropathy Study Group (ESSG) and Amor criteria in newly referred consecutive patients with undiagnosed peripheral arthritis, and/or enthesitis, and/or dactylitis that usually began before 45 years of age. The clinical diagnosis (SpA vs no SpA) made by the ASAS rheumatologist served as reference standard. Results In all, 24 ASAS centres included 266 patients, with a final diagnosis of SpA being made in 66.2%. After adjustments a final set of criteria showed the best balance between sensitivity (77.8%) and specificity (82.9%): arthritis and/or enthesitis and/or dactylitis plus (A) one or more of the following parameters: psoriasis, inflammatory bowel disease, preceding infection, human leucocyte antigen B27, uveitis, sacroiliitis on imaging, or (B) two or more other parameters: arthritis, enthesitis, dactylitis, inflammatory back pain in the past, family history of SpA. The new criteria performed better than modified versions of the ESSG (sensitivity 62.5%, specificity 81.1%) and the Amor criteria (sensitivity 39.8%, specificity 97.8%), particularly regarding sensitivity. In the entire ASAS population of 975 patients the combined use of ASAS criteria for axial SpA and ASAS criteria for peripheral SpA also had a better balance (sensitivity 79.5%, specificity 83.3%) than the modified ESSG (sensitivity 79.1%, specificity 68.8%) and Amor criteria (sensitivity 67.5%, specificity 86.7%), respectively. Conclusions The new ASAS classification criteria for peripheral SpA performed well in patients presenting with peripheral arthritis, enthesitis and/or dactylitis. Within ASAS there was great interest to also develop criteria for patients with SpA with predominant peripheral manifestations and to compare these with the European Spondylarthropathy Study Group (ESSG)1 and Amor criteria,2 both of which have been generated in the early 1990s as classification criteria not specifically for peripheral SpA but for the entire group of SpA that includes peripheral SpA (for details of these criteria see Sieper et al7 or visit the ASAS slide library at http://www.asas-group.org). This ASAS project resulted in new classification criteria for peripheral SpA, which are presented in this paper. ASAS rheumatologists were invited to participate. Patients with peripheral manifestations including peripheral arthritis, and/or enthesitis, and/or dactylitis, that usually began before 45 years of age and absence of back pain were included if they were new referrals to the rheumatology department and did not have an established diagnosis but only suspicion of SpA such as arthritis of the lower limb or asymmetric arthritis. Thus, the study protocol was similar to that of the axial arm of the study.6 To minimise selection bias it was required that patients were included in a strictly consecutive manner. After written informed consent was obtained a diagnostic investigation was performed, and the results including the final diagnosis were documented in a case report form. Peripheral arthritis, enthesitis and dactylitis were assessed clinically. Joints affected by arthritis were marked on a 64-joint manikin. The Mander index8 was used for enthesitis. For dactylitis the affected finger or toe was documented. 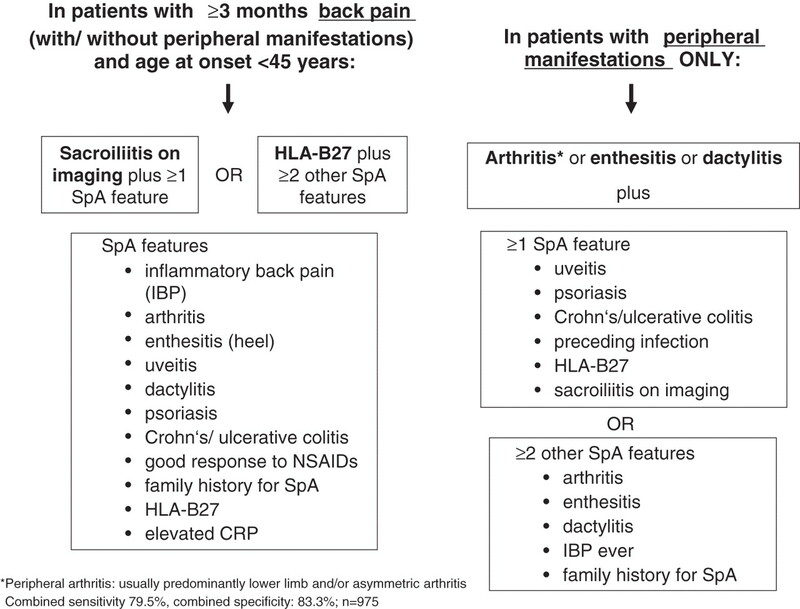 In addition, the following other SpA features were assessed: past inflammatory back pain (IBP) as judged by the rheumatologist, history of uveitis, psoriasis, IBD, preceding gastrointestinal or urogenital infection and a positive family history of SpA (presence in a first-degree or second-degree relative of (1) AS, (2) reactive arthritis, (3) psoriasis, (4) IBD, (5) uveitis). Mandatory laboratory tests included human leucocyte antigen B27 (HLA-B27) and C reactive protein. MRI of the sacroiliac (SI) joints and plain radiographs of the pelvis were strongly recommended in order to obtain information about involvement of the axial skeleton in patients with peripheral manifestations only. Radiographic sacroiliitis was graded locally according to the modified New York criteria.3 MRI findings were documented as the presence or absence of typical signs of active inflammation of the SI joints. The final clinical diagnosis (SpA or no SpA) was made locally by the ASAS rheumatologist who also indicated the level of confidence with this judgement on a numerical rating scale from 0 (not confident at all) to 10 (very confident). Two sets of candidate criteria for peripheral SpA were developed, based on clinical reasoning and tested in a limited number (n=35) of paper patients (supplementary table 1), as has been done in the previous study on axial SpA.5 Accordingly, patients have to have peripheral arthritis compatible with SpA, and/or enthesitis, and/or dactylitis as entry manifestation and, in addition, have to have two or more of uveitis, preceding infection, psoriasis, IBD, positive family history of SpA, HLA-B27, arthritis, enthesitis, dactylitis, IBP (past) in set 1 of the criteria. In set 2 of the candidate criteria one entry manifestation plus one or more of preceding infection, psoriasis, or IBD suffices for the fulfilment of the criteria, or plus two or more of the remaining parameters as in set 1 (see above). These prespecified candidate criteria, including some adjustments, were then tested in consecutive real patients. The expert doctor's diagnosis (SpA vs no SpA) was used as the external (reference) standard. Multivariable logistic regression analysis was performed to identify parameters contributory to explaining variance in the classification (SpA vs no SpA). The prespecified candidate criteria for peripheral SpA were compared to the ESSG1 and Amor2 criteria using cross tables and sensitivity and specificity were calculated. Similar comparisons were made also in the entire ASAS population of 975 patients in whom the candidate criteria for peripheral SpA were applied to patients with peripheral manifestations only and the ASAS criteria for axial SpA applied to patients with predominantly axial manifestations with or without peripheral manifestations. The ESSG and Amor criteria were both modified by adding the parameter ‘active sacroiliitis on MRI’ as has been done previously.5 6 The item enthesitis was analysed either as ‘enthesitis at any site’ as well as ‘enthesitis of the heel’ only (enthesitis of Achilles tendon and/or plantar fascia). All data analyses were performed jointly by four ASAS members (DvdH, RL, IJS, MR) using SPSS V.17.0 (SPSS, Chicago, Illinois, USA) during a 2-day meeting. The results of this study were presented and discussed at the annual ASAS meeting in Rome in January 2009, and the attending ASAS members voted on a preferred set of criteria. Of 277 patients included according to the protocol, 266 patients had current peripheral arthritis, enthesitis and/or dactylitis. The remaining 11 patients had any 1 of these manifestations in the past but not at study entry and were excluded from the analysis. The 266 patients were recruited from 24 centres in 15 countries: 133 patients were recruited in Asia, 116 in Europe including Turkey and 17 patients in South America. In all, 8 centres (33%) included &#x0026;#x003E;10 patients each, 3 centres (12.5%) 6–10 patients and 13 centres (54%) 1–5 patients; 176 of the patients were diagnosed as having peripheral SpA (66.2%) and 90 (33.8%) as having no SpA. In general, experts felt confident with their diagnosis as indicated by levels of confidence of ≥6 in 97.4% and ≥7 in 85.3%, with no difference regarding SpA versus no SpA. A total of 15% of patients were older than 45 years at disease onset but were not excluded. Therefore, all 266 patients were included in the analyses. Patients diagnosed as having SpA as opposed to patients without SpA were younger and more often male (table 1). The most frequent single peripheral manifestation was peripheral arthritis (46.6%), followed by enthesitis (9.8%) and dactylitis (1.9%). In all, 41% of patients had a combination of peripheral manifestations at first presentation, most commonly arthritis plus enthesitis (28.9% of all patients). The mean (SD) duration of peripheral arthritis was 10.3 (18.6) months, and that of enthesitis was 9.0 (16.0) months. The typical SpA pattern of arthritis (asymmetric and/or predominantly lower limb) was found in 86.6% of the 231 patients with arthritis. None of the 266 patients had back pain/IBP at presentation, but 34 patients had IBP in the past (25 patients in the SpA group and 9 patients in the no SpA group). Radiographs of the SI joints were performed in 85.3% and MRI of the SI joints in 22.5% of all patients. Of note, 19.5% of patients diagnosed as having SpA had definite radiographic sacroiliitis (all were HLA-B27 positive), and 44% of patients with SpA who underwent MRI investigation had active inflammatory lesions of the SI joints (table 1): HLA-B27 was positive in 81.8% of these 22 patients, yet none had currently IBP and 4 (18%) had IBP in the past. The most frequent specific diagnoses in the non-SpA group were undifferentiated monoarthritis or oligoarthritis (31.5%), rheumatoid arthritis (21%), gout (20%) and osteoarthritis (10.1%). Other diagnoses occurred infrequently and included sarcoidosis, HIV related arthritis, lupus, plantar fasciitis, borreliosis, for example. Frequencies of single parameters are shown in table 1. Multivariable logistic regression analysis revealed age (p=0.034), HLA-B27 (p&#x0026;#x003C;0.001), a positive family history for SpA (p=0.018), enthesitis (p&#x0026;#x003C;0.001), psoriasis (p=0.004) and definite radiographic sacroiliitis (p=0.004) to be independently associated with SpA after adjustments were made for gender, peripheral arthritis, dactylitis, uveitis, IBP in the past and preceding infection (table 2). The parameters IBD and MRI of SI joints had to be removed from the regression because of infinity. Moreover, there were too few patients with available MRI information. Substituting ‘enthesitis of the heel’ (OR 2.07, 95% CI 0.87 to 5.02; p=0.097) for ‘enthesitis at any site’ did not significantly change the overall result from the regression analysis, nor did substituting ‘oligoarthritis’ (OR 1.92, 95% CI 0.912 to 4.05; p=0.86) for ‘any arthritis’. Table 3 shows sensitivity and specificity of the prespecified candidate criteria, of various modifications thereof, and of the ESSG and Amor criteria with their respective modifications. Both sets of prespecified candidate criteria had a good specificity (90% and 84.4%, respectively) while sensitivity was moderate only (62.5% and 67%, respectively). In comparison, the specificity of the ESSG (81.1%) and of the Amor (97.8%) criteria was also good, however, both were lacking sensitivity (55.1% and 35.2%, respectively). Modifying set 1 of the candidate criteria in that one SpA feature in addition to the entry manifestation arthritis/enthesitis/dactylitis suffices (set 1A and 1A_h) did not improve the overall performance (increase in sensitivity but decrease in specificity). However, when more weight was given to single variables such as psoriasis, IBD and preceding infection (prespecified set 2 of the candidate criteria), sensitivity increased (67% vs 62.5% of set 1). Thus, more weight was given to other rather specific SpA features including HLA-B27 (set 2B and 2B_h), uveitis (set 2C and 2C_h) and sacroiliitis on imaging (set 2D) in order to increase sensitivity. In fact, these modifications resulted in better balanced sensitivities and specificities with the best trade off found for set 2D (sensitivity 77.8%, specificity 82.2%) (figure 1). Final set of classification criteria for peripheral spondyloarthritis (SpA) (set 2D) selected by Assessment of SpondyloArthritis international Society (ASAS). The criteria are applicable to patients with peripheral arthritis (usually predominantly of the lower limbs and/or asymmetric arthritis), and/or enthesitis, and/or dactylitis. The various SpA features are defined in table 5. In the 266 patients in this study, the sensitivity of the criteria was 77.8%, the specificity 82.2%. 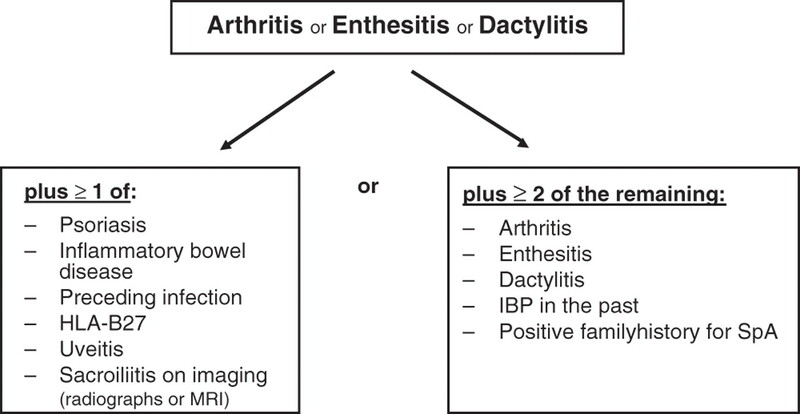 The item ‘sacroiliitis on imaging’ (definite radiographic sacroiliitis or sacroiliitis on MRI according to the consensus definition9) was included in the modified candidate criteria because (1) radiographic sacroiliitis contributed independently to the classification as SpA in the regression analysis and (2) sacroiliitis on MRI appeared to be highly relevant for the classification of patients (table 1). The restriction of ‘enthesitis at any site’ to ‘enthesitis of the heel’ consistently resulted in a drop of sensitivity by 5% to 10% in all sets of criteria tested but a gain in specificity of around 1% only (table 3), therefore ‘enthesitis at any site’ was chosen. In the entire ASAS study on new criteria for axial and peripheral SpA a total of 975 patients (709 with undiagnosed chronic back pain with or without peripheral manifestations and 266 with undiagnosed arthritis/enthesitis/dactylitis) had been included between July 2006 and December 2008. A total of 650 patients had been diagnosed as having SpA, of whom 37.7% had axial involvement only, 33.5% had peripheral involvement only and 28.8% had axial and peripheral involvement. In the entire study population the performance of the new ASAS criteria was assessed as follows: for patients with back pain irrespective of peripheral manifestations we applied the new ASAS criteria for axial SpA6 and for patients with peripheral manifestations only we applied the candidate criteria set 2D. As can be seen from table 4, the combination of the two new criteria from ASAS resulted in a better balance of sensitivity and specificity than ESSG or Amor criteria (figure 2). Combined use of the Assessment of SpondyloArthritis international Society (ASAS) criteria for axial spondyloarthritis (SpA) and the ASAS criteria for peripheral SpA in the entire SpA population. In patients with predominantly axial involvement (back pain) with or without peripheral manifestations, the ASAS criteria for axial SpA6 are applied. In patients with peripheral manifestations only, the ASAS criteria for peripheral SpA are applied. In the entire ASAS population of 975 patients sensitivity and specificity of the combined use of the two sets of criteria were 79.5% and 83.3%, respectively. At the annual meeting of ASAS in Rome in January 2009 the results were presented and discussed. The attending full ASAS members voted for (1) preference of new ASAS criteria over ESSG and Amor in patients with peripheral SpA (67% of votes), (2) preference of using candidate criteria set 2D (figure 1 and table 5) (66% of the votes) and (3) using the combination of new criteria for axial SpA in patients with predominant back pain (with or without peripheral manifestations) and new criteria set 2D for peripheral SpA for patients with peripheral manifestations only (67% of the votes). In a series of papers published in the Annals of the Rheumatic Diseases we have embarked under the auspices of ASAS on the development and validation of new classification criteria for axial and peripheral SpA. For patients with axial SpA these efforts included a new definition of IBP,10 the development5 and validation6 of new classification criteria for axial SpA and the definition of active (inflammatory) sacroiliitis on MRI by a consensual approach.9 Finally, new ASAS classification criteria for patients with peripheral SpA were developed and tested which are presented herein. The patients included in this study had peripheral arthritis, enthesitis and/or dactylitis of less than 1-year duration. All patients were new referrals, had undiagnosed disease and only suspicion of SpA. To avoid selection bias patients had to be included in a strictly consecutive way. The final diagnosis by the local ASAS expert rheumatologist was used as the reference standard. Obviously, the rheumatologist's diagnosis is influenced by knowledge and experience, and by already existing criteria for SpA such as the ESSG or Amor criteria. It is therefore of particular note that the ESSG and Amor criteria did not perform very well in terms of sensitivity in this study, indicating that peripheral SpA according to the opinion of the rheumatologist is not perfectly captured by these existing criteria. Both sets of the prespecified ASAS candidate criteria had greater sensitivity (62.5% and 67%, respectively) than the ESSG and Amor criteria. However, in set 1 the requirement of two further SpA features in addition to the entry manifestation seemed to be too restrictive since a considerable proportion of patients diagnosed as having peripheral SpA had in fact only one additional SpA feature. In the prespecified candidate set 2, more weight was given to the single items psoriasis, IBD and preceding infection which already led to an increase in sensitivity. In further modifications more weight was given also to other rather specific SpA parameters including HLA-B27, uveitis and sacroiliitis on imaging, which resulted in the final set of criteria (set 2D) with a balanced sensitivity of 77.8% and a specificity of 82.2%. Since the cohort of patients was too small to be split into a ‘test’ and a ‘validation’ dataset, we could not validate the final adjustments as we did for the axial SpA criteria.6 Therefore, future testing of the new criteria in independent cohorts is worthwhile to overcome this limitation. The poor sensitivity of 35% of the Amor criteria in our study may be partially explained by the fact that peripheral arthritis in the Amor criteria is strictly defined as oligoarthritis (ie, two to four joints) whereas in this ASAS study 46% of patients with SpA had either monoarthritis or polyarthritis. Furthermore, to fulfil the Amor criteria six points (ie, three to four items) are needed.2 This seems quite difficult to reach for patients with peripheral manifestations only, yet considered to have SpA. The ESSG criteria were also lacking sensitivity (55.1%), which may be contributable to the sole consideration of arthritis, but not enthesitis or dactylitis, as entry criterion in the ESSG criteria.1 In our study, 14.8% of patients with SpA had enthesitis and/or dactylitis at entry without arthritis. The lack of HLA-B27 in the list of SpA parameters may further limit the sensitivity of the ESSG criteria. HLA-B27 was a very strong parameter differentiating between SpA and no SpA in our study (47.2% vs 5.6%), and was identified as a strong contributor in the logistic regression analysis. Of note, HLA-B27 was also the strongest differentiating parameter in the original ESSG study in patients with IBP and patients with peripheral arthritis, but was explicitly excluded from the formal set of the criteria at that time because the ESSG criteria were meant to be applicable in epidemiological studies without the need for human leucocyte antigen (HLA) typing.11 Thus, it seems that for many rheumatologists HLA-B27 positivity is important for considering SpA in patients with back pain6 12 and in patients with peripheral arthritis of the SpA type and/or enthesitis and/or dactylitis. The Amor and ESSG criteria and the new ASAS criteria were further challenged in the entire ASAS study population of 975 patients. The combined use of the new ASAS criteria for axial SpA in patients with predominant back pain with or without peripheral manifestations and of the new ASAS criteria for peripheral SpA (set 2D) in patients with peripheral manifestations only, yielded a better balance of sensitivity (79.5%) and specificity (83.3%) than the ESSG and Amor criteria did. A formal voting process at the annual ASAS meeting in 2009 revealed a preference for the new ASAS criteria for peripheral SpA over ESSG and Amor. The relatively high prevalence of sacroiliitis on imaging (either by radiographs or by MRI) was an interesting finding. None of the patients with radiographic sacroiliitis (n=34) had current back pain (only seven patients had IBP in the past) and none of them had limitations of spinal mobility or of chest expansion, so none of them fulfilled the modified New York criteria for AS. Sacroiliitis on MRI was also frequent but the number of patients with MRI investigation was small, and more research is needed regarding this topic. Since sacroilliitis on imaging contributed to a diagnosis of SpA in our study this item was included in the criteria. Enthesitis of the heel has been considered as highly specific for SpA and became part of the ESSG criteria1 and of the ASAS criteria for axial SpA.6 In the current study, however, enthesitis at sites excluding the heel, was found in 20.7% of patients. Restricting enthesitis in the various candidate criteria to the heel resulted in a drop of sensitivity by 5% to 10% with a concomitant gain in specificity of around 1% only. Therefore, the item ‘enthesitis (of any site)’ and not ‘enthesitis of the heel’ was chosen in the final set of criteria. In summary, the new ASAS classification criteria for peripheral SpA seem to reflect better than the ESSG and Amor criteria the current perception of ASAS rheumatologists of what peripheral SpA of short duration looks like (‘gestalt’). With the entry manifestations ‘peripheral arthritis, usually of the SpA type’, ‘enthesitis’ and/or ‘dactylitis’ the criteria are comprehensive and the target population is well defined. Patients with few but typical clinical manifestations may be better captured by these criteria than with the ESSG or Amor criteria. Further studies should evaluate the performance of the new criteria in other settings. We would like to thank J Listing, Berlin, Germany, for additional statistical help.
. [Criteria of the classification of spondylarthropathies]. Rev Rhum Mal Osteoartic 1990;57:85–9.
. A wider spectrum of spondyloarthropathies. Semin Arthritis Rheum 1990;20:107–13.
. The Assessment of SpondyloArthritis international Society (ASAS) handbook: a guide to assess spondyloarthritis. Ann Rheum Dis 2009;68(Suppl 2):ii1–44.
. Studies with an enthesis index as a method of clinical assessment in ankylosing spondylitis. Ann Rheum Dis 1987;46:197–202.
. Defining active sacroiliitis on magnetic resonance imaging (MRI) for classification of axial spondyloarthritis: a consensual approach by the ASAS/OMERACT MRI group. Ann Rheum Dis 2009;68:1520–7.
. Diagnostic features of ankylosing spondylitis. Br J Rheumatol 1995;34:301–3. Participators The following ASAS members who are not authors of this manuscript have contributed by inclusion of at least one patient or have participated in the paper patient exercise: J Braun, Herne, Germany; R Burgos-Vargas, Mexico City, Mexico; E Collantes-Estevez, Cordóba, Spain; J Darmawan, Semarang, Indonesia; J Davis, San Francisco, California, USA; B Dijkmans, Amsterdam, The Netherlands; K de Vlam, Leuven, Belgium; P Emery, Leeds, UK; O Fitzgerald, Dublin, Ireland; R Inman, Toronto, Ontario, Canada; M A Khan, Cleveland, Ohio, USA; M Leirisalo-Repo, Helsinki, Finland; A Linnssen, Ijmuiden, The Netherlands; W Maksymowych, Edmonton, Alberta, Canada; C Naclerio, Scafati, Italy; R Sturrock, Glasgow, UK; I van der Horst-Bruinsma, Amsterdam, The Netherlands; S van der Linden, Maastricht, The Netherlands. Funding This study was supported financially by ASAS. Ethical approval Ethical approval for the conduct of the study was obtained from local ethical committee in each centre and written informed consent was obtained from all patients.